Parents understandably have high expectations for their children. Sometimes problems can arise. These may include issues with behavior, academics, or emotional control. We have over 20 years of experiencing treating these issues. Play Therapy is the primary treatment technique used with children younger than 12 years of age. We employ non-directive play therapy, art play therapy, magic, and puppets to facilitate change. This is necessary because young children are not always able to communicate verbally. They tend to be more effective acting out the things that trouble them. In recent years a growing number of noted mental health professionals have observed that play is as important to human happiness and well being as love and work (Schaefer, 1993). Some of the greatest thinkers of all time, including Aristotle and Plato, have reflected on why play is so fundamental in our lives. The following are some of the many benefits of play that have been described by play theorists. Play therapy is a structured, theoretically based approach to therapy that builds on the normal communicative and learning processes of children (Carmichael, 2006; Landreth, 2002; O’Connor & Schaefer, 1983). The curative powers inherent in play are used in many ways. Therapists strategically utilize play therapy to help children express what is troubling them when they do not have the verbal language to express their thoughts and feelings (Gil, 1991). In play therapy, toys are like the child’s words and play is the child’s language (Landreth, 2002). Through play, therapists may help children learn more adaptive behaviors when there are emotional or social skills deficits (Pedro-Carroll & Reddy, 2005). The positive relationship that develops between therapist and child during play therapy sessions provides a corrective emotional experience necessary for healing (Moustakas, 1997). Play therapy may also be used to promote cognitive development and provide insight about and resolution of inner conflicts or dysfunctional thinking in the child (O’Connor & Schaefer, 1983; Reddy, Files-Hall & Schaefer, 2005). … toys are the child’s words! Children are referred for play therapy to resolve their problems (Carmichael; 2006; Schaefer, 1993). Often, children have used up their own problem solving tools, and they misbehave, may act out at home, with friends, and at school (Landreth, 2002). Play therapy allows trained mental health practitioners who specialize in play therapy, to assess and understand children’s play. Further, play therapy is utilized to help children cope with difficult emotions and find solutions to problems (Moustakas, 1997; Reddy, Files-Hall & Schaefer, 2005). By confronting problems in the clinical Play Therapy setting, children find healthier solutions. Play therapy allows children to change the way they think about, feel toward, and resolve their concerns (Kaugars & Russ, 2001). Even the most troubling problems can be confronted in play therapy and lasting resolutions can be discovered, rehearsed, mastered and adapted into lifelong strategies (Russ, 2004). Although everyone benefits, play therapy is especially appropriate for children ages 3 through 12 years old (Carmichael, 2006; Gil, 1991; Landreth; 2002; Schaefer, 1993). Teenagers and adults have also benefited from play techniques and recreational processes. To that end, use of play therapy with adults within mental health agencies, and other healthcare contexts is increasing (Pedro-Carroll & Reddy, 2005; Schaefer, 2003). 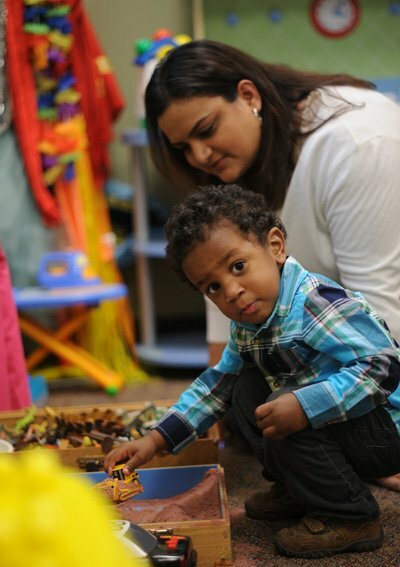 In recent years, play therapy interventions have also been applied to infants and toddlers. Play therapy is implemented as a treatment of choice in mental health, school, agency, developmental, hospital, residential, and recreational settings, with clients of all ages (Carmichael, 2006; Reddy, Files-Hall & Schaefer, 2005). Play therapy treatment plans have been utilized as the primary intervention or as an adjunctive therapy for multiple mental health conditions and concerns (Gil & Drewes, 2004; Landreth, Sweeney, Ray, Homeyer & Glover, 2005), e.g. anger management, grief and loss, divorce and family dissolution, and crisis and trauma, and for modification of behavioral disorders (Landreth, 2002), e.g. anxiety, depression, attention deficit hyperactivity (ADHD), autism or pervasive developmental, academic and social developmental, physical and learning disabilities, and conduct disorders (Bratton, Ray & Rhine, 2005). Research supports the effectiveness of play therapy with children experiencing a wide variety of social, emotional, behavioral, and learning problems, including: children whose problems are related to life stressors, such as divorce, death, relocation, hospitalization, chronic illness, assimilate stressful experiences, physical and sexual abuse, domestic violence, and natural disasters (Reddy, Files-Hall & Schaefer, 2005). Play therapy helps children.